I recently took this exact online quiz. 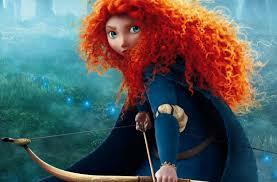 Now, I am not going to lie, I already know which princess I am most akin to, Merida from Brave of course! So as I answered each question I made sure to weight each answer to align most closely with Merida. And thankfully, I was rewarded for my tenacity and rightfully named Merida. This crimson-haired princess awakens to her own strength and finds the courage to define her own fate. Fabulous story! As the Youth Librarian, I am constantly running into princess tales and as far as I am concerned, the princess who lives life bravely and decides her own fate is the story I want to read. For our littlest readers, I recommend Carmela LaVigna Coyle’s Do Princesses Really Kiss Frogs? In this book, we go on a wonderful adventure with our main character and find out that princesses can do many things, like dangle their toes in the creek and climb boulders. What is so very fun about reading princess stories is that, although you may find many books with damsels waiting to be saved, a new generation of princesses in literature are becoming more prominent. And not to be forgotten, the princes among us, are also being re-imagined and are becoming characters with emotional depth. For our beginner readers, how about The Kingdom of Wrenly; The Lost Stone by Jordan Quinn. This, new to the library, series follows prince Lucas as he finds fun and friendship with Clara Gill. Great mid-level reads that explore the genre of new age princesses and princes include: The Hero’s Guide series by Chritopher Healy. The Sisters Grimm series by Michael Buckley, and The Hero’s of Olympus by Rick Riordan. Tenacity and strength, compassion and friendship, today’s children’s literature is beginning to move beyond the stereotypical troupe and embrace the array of individuality. As for our teens, gender stereotypes continue to be explored and uprooted. The series Falling Kingdoms by Megan Rhodes is a great example of the ever shifting image of prince and princess.